On April 7, 1968, 3 days after his death, a large remembrance walk for Martin Luther King was held in Amsterdam. It started at the statue Dokwerker, where a large portrait of Dr. King with a black ribbon was placed. The Dokwerker is a statue to remember the February Strike, that took place on February 25, 1941, in World War II. During the German occupation Jews were refused to enter more and more places: trams, public buildings, swimming pools. But when even shops and bars became prohibited, Amsterdammers didn't take it any longer and went on strike. The strike lasted two days and German soldiers ended the strike which caused 9 deaths and more than 20 wounded. Every year the strike is remembered at the Dock Worker. 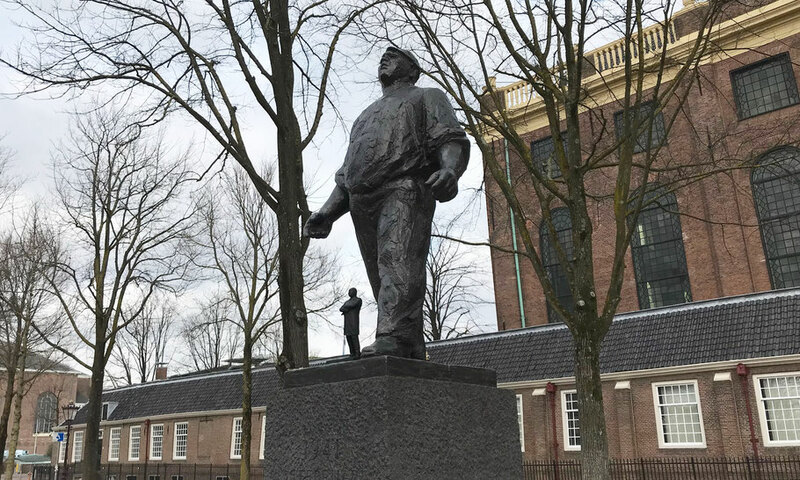 The statue by Mari Andriessen was revealed in 1952 by Queen Juliana and is located on Jonas Daniël Meierplein.